These vocal pa hire systems are part of our audio visual hire solutions. These are the perfect Party sound system hire for at home, conferences, functions, expos, meetings, speeches, weddings, lectures, dance and aerobic classes, and certainly as small DJ systems. Whatever the occasion, we have the right pa speakers for your event. Read more about Public Address Systems (another name for vocal pa) on wikipedia here. Easy pickup from Newmarket, we provide PA Hire or sound system hire in Auckland. You can even hire a portable PA, or hire a megaphone as a backup option for your parade. Powered PA Speakers are $75+GST each &amp; can be used for both Front of house, spread or foldback monitors. Speaker Stands are $15+GST each. Mixer or Mixing Desk is $25+GST for a 4 channel audio mixer and $10+GST Per additional channel required. DI Box is $10+GST per channel required. ipod cable or aux cable if needed. 18 inch Powered Sub $90+GST. Party lights are $25+GST each. Hire a megaphone for $30+GST. Upgrade to Battery powered PA system ADD $30+GST. 1 x powered (active) pa hire speaker. 1 standard microphone, stand &amp; cable – plug straight into the back of the speaker – all our speakers have 2 inputs with volume controls on the back. A mobile battery-powered vocal PA hire system or portable speaker hire is also available for an additional $30+GST. 2 x powered (active) hire pa speakers. cables to connect everything together. 2 standard corded microphones, 2 stands and cables. Great Party Sound System Hire. 3 x powered (active) pa hire speakers (e.g 2 tops and a sub OR 2 tops and a monitor). up to 3 speaker stands depending on your configuration choice above. 2 corded mics, 2 stands and cables. Perfect for a DJ to rock your house or office party. 4 x powered (active) pa speakers (e.g 2 tops and 2 subs OR 2 tops, a sub and a monitor OR 4 tops for spread!). up to 4 speaker stands, customised for your configuration choice above. 2 standard mics, 2 stands and cables. swap any sub for a monitor if needed. 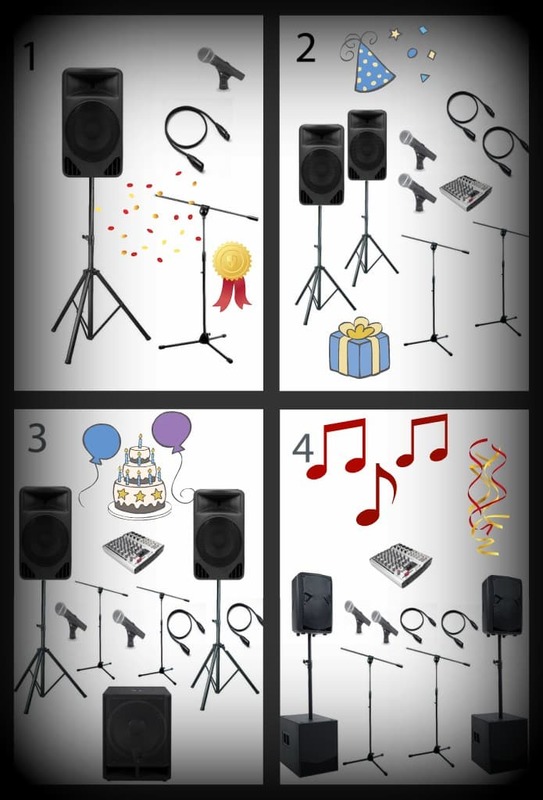 This Party Sound System hire is Great for Musicians or Djs to play through. Swap any microphone for a DI for no extra charge. Add an extra microphone with stand and cable for $10+GST each. Upgrade from 4 ch desk to 12 channel desk for $30+GST. Add additional wireless microphones for $50+GST each. Per Km out of town delivery charges apply if you are not within Auckland. Setup of the PA is a minimum call out fee of $75+GST. Packdown and Packout of the PA is a minimum call out fee of $75+GST anywhere in Auckland. System tech/sound engineer if needed – enquire as they all have different per hour rates – for the night or day depending on who is available. All our system techs are qualified and experienced sound engineers that can mix any conference or band. Wireless hand held microphone or wireless beltpack/headset $60+GST each. Headset microphone to plug into wireless beltpack $15+GST. UPGRADE to 16 Channel Allen and Heath mixing desk with full FX rack (multi effects unit, reverb and delay, 6 channels of 31 band EQs, 4 compressor/limiter/gates) ADD $100+GST. Pioneer DJM-800 Mixer = $75+GST. LED Par64 cans with clamps or floor stands $25+GST. Floor mount par cans $25. Party lights and lasers $25+GST each.